The best way to face your fears is to just eat them. A little salty, a little sweet, and so, SO easy. Recipe here. Anybody afraid of spiders should stay far, far away from there. Recipe here. Coat a cheeseball with paprika, and garnishe with a little piece of scallion green. Recipe here. Candy corn may be a love-it-or-hate-it food, but cheese is a universal favorite. Instructions here. Shuck oysters, reserve juices, pour everything into a tall pitcher. Definitely scary. Instructions here. 6. Guacamole From a Pumpkin. Cool? Eww? I don't know, but it's definitely festive. All you need is a carved pumpkin, some chips, and your favorite guacamole. 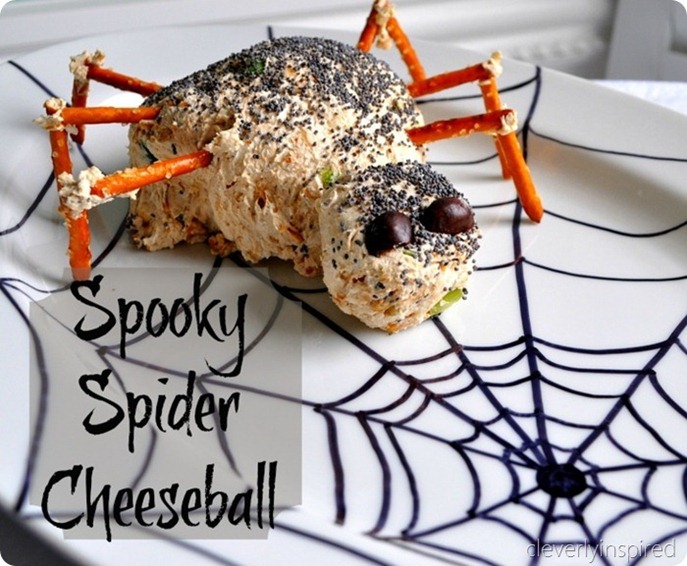 Just some 7-layer dip, with a sour cream spider web on top. Instructions here. Eat your fears. Recipe here. Because really, nothing is creepier than savory food in a Jell-O mold. Recipe here. Sliced hot dogs and black beans? Only because it does look pretty festive. Instructions here.